FULTON HOMES has been one of Arizona's top builders for over 40 years. . .
At Fulton Homes, we don't just build homes; we build neighborhoods and communities that stand the test of time. We proudly invite you to not only visit our active communities, but those sold out years ago. You will immediately see the difference found in a Fulton Homes neighborhood. How many builders would invite you to visit their old neighborhoods? Because of our singular focus on Arizona, we understand the best locations in the Valley to live. This is why you'll find Fulton Homes communities near freeways, shopping, employment and other amenities. We believe the quality of lifestyle is an important factor, which is why you'll find more parks and green spaces in a Fulton community. It is also why you'll find unique amenities like aquatic centers, parks, and tot-lots. For over 40 years, Fulton Homes' inspired home designs have served as the benchmark for great homes in the Valley of the Sun. Although our designs are often copied by other builders, Fulton Homes remains committed to building homes that fit your lifestyle. Fulton Homes offers more choice of floorplans and floorplan configurations than any other builder in town. Add in the best Design Center in Arizona, and it's clear no other builder can offer the choice and customization of a Fulton Home. Discover many more standard features included in every Fulton Home. . . Discover more EnergySTAR® features. . .
No two buyers are exactly alike, but many builders build the same tired floorplans and give customer's very little flexibility. Fulton Homes has more ways to customize your new home than any other builder in Arizona - with dozens of room configuration choices and the best Design Center in the business. Want to change that study into a bedroom? No problem. Want to convert a garage bay into a bonus room? We've got you covered. 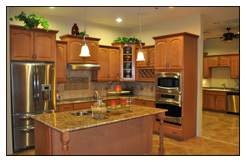 In addition to room configurations, the Fulton Homes Design Center is simply the best in Arizona. With a nearly 13,000 sq.ft. showroom, thousands of options to choose from, and help from our expert designers, your new Fulton Home is guaranteed to look great and live just the way you want. And, because Fulton Homes includes such a high level of standard features in every home, upgrades are never out of reach. Check out our Online Design Center™ to begin browsing options online, or visualize the kitchen of your dreams using our exclusive Room Visualizer. With prices and interest rates at all time lows, there has never been a better time to buy a new home. However, not all lenders are created equal. With the Fulton Homes Preferred Lender Program, we've done the leg work for you. You can select between several lenders with a proven track record of helping customers get the financing they need. Fulton Homes Preferred Lenders have a wealth of experience and offer a variety of lending options. Contact our preferred lenders today to inquire about current mortgage programs, interest rates or to start the mortgage application process. At Fulton Homes, we know you can't always wait to build a new home from scratch. That is why we keep an inventory of Quick Move-In Homes held at different stages of construction. This way, you can set a move-in time frame that suits your needs and still add options and customize many of the home's design elements. Check out our quick move-in homes online. You can further refine your search using our advanced search tools. When Ira Fulton started building homes over 40 years ago, he didn't want to be one of the biggest, just the best. Throughout our long history, Fulton Homes has never forgotten what has made us successful - building high quality homes and great neighborhoods in the beautiful Valley of the Sun. Fulton Homes is the largest family-owned and operated homebuilder in Arizona. To us, Arizona is not just another marketplace. . . it's the place we call home. Fulton Homes and the Fulton Family Foundation have long been recognized as exemplar corporate citizens. We continue to donate 30% of our profits to worthy causes, and proudly support local campaigns for education, water safety, and other charities important to Arizona families.